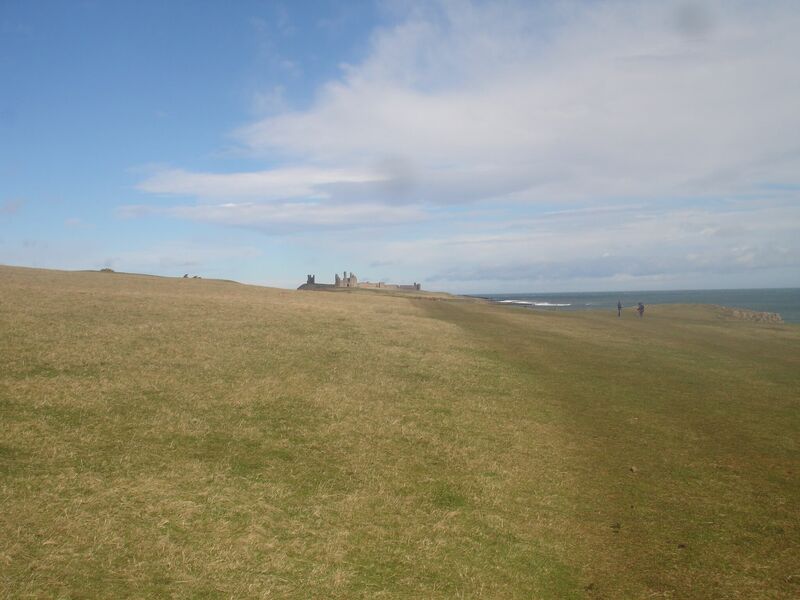 The walk up to Dunstanburgh Castle along a section of the Northumberland coastline is one of the best bits about it, or would have been had we not chosen it to break up the second day of our journey from the centre of the known universe (London) to the barabaric wilds of nowhere (Edinburgh) on the windiest day EVAH. 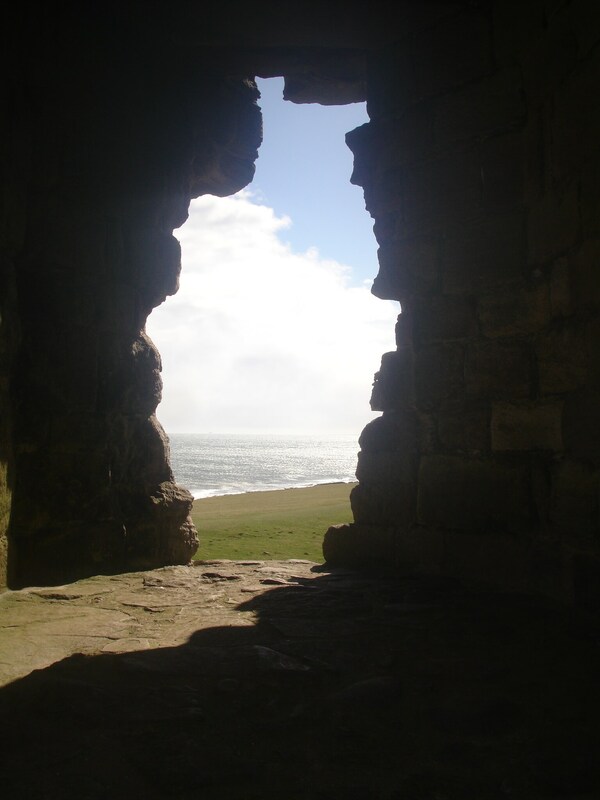 Dunstanburgh Castle is a massive ruined fortification begun in the early 1300s by someone who wanted to set himself up in opposition to the king. This did not go well for him. But the castle went from strength to strength, being an excellent place to harry the Scots from, until the Wars of the Roses, when fierce fighting for its control between the supporters of the red flower and supporters of the white flower led to it falling into disrepair and eventual decay. People really felt strongly about horticultural matters back in the day, huh? Good thing we don’t get het up enough about inconsequential disagreements to go about fighting each other over them now. But back to the approach, through land owned by the National Trust. Firstly, its fabulousness is because the path runs along the seashore. Now, it’s not a sandy beach, nor even pebbles, just rocks and I have no idea whether or not it is particularly good for swimming, but the rocks are very scramblable and, even better, there are lots of rock pools! We had an excellent time for about an hour climbing around looking for small seawater creatures. Found some too! Couple of snaily things, a few shrimps, some wriggly water bugs and a dead crab. Plus, the oyster catchers seemed not to be expecting us and let us sneak up quite close before flapping away. Secondly, there are sheep. SHEEEEEP! ‘Nuff said. But these sheep do not just stand there chewing grass at you, they come down to the beach, climbing impossibly along a precipitous track to get there. Cool! Thirdly, the gorse was in full bloom when we were there. I’ve never seen gorse before and its flowers are bright yellow. My favourite colour! It’s pretty startling in this landscape. Gorse is great. Fourthly, when you do emerge from the water’s edge, you get an excellent view of the sprawling ruins in the distance over fields of gently rolling grassland. It’s very picturesque. … and closer and noticing new details and angles, and getting to take lots and lots of photos of the same thing. If you are Mama. But there’s that word. Distance. 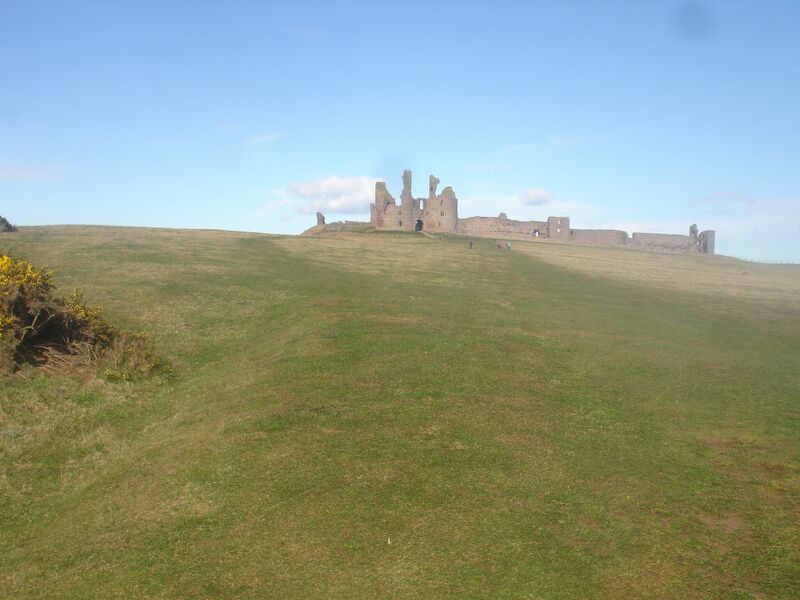 Some things are small, Mama, and some things are far away, and Dunstanburgh Castle is quite a walk on half a packet of rice cakes. Especially when the aforementioned wind is so strong that you can stand there with your arms outstretched and lean into it and not fall on your face. Mama and my Brilliant Big Brother did that a lot at first. Some while later (an eon later in my opinion), Mama was finding that strong gusts made it hard to catch her breath, and had a moment’s doubt about carrying on. But the castle was demonstrably nearer (a bit nearer, Mama), and having come so far, she thought we might as well push on. By the time we were on the final approach, Mama was carrying me, which is unheard of, and I was wailing, which isn’t, but in honour of the occasion I was keening, ‘wind, wind go away, come again another day,’ over and over again in a small unhappy voice. A version I composed myself, people! And even my Brilliant Big Brother had stopped bounding around the fields in the hope of flushing out more sheep from behind some gorse. Still, we really were very close now, and Mama was hopeful that the still imposing stone walls might provide some kind of shelter. But in fact, worse was to come. 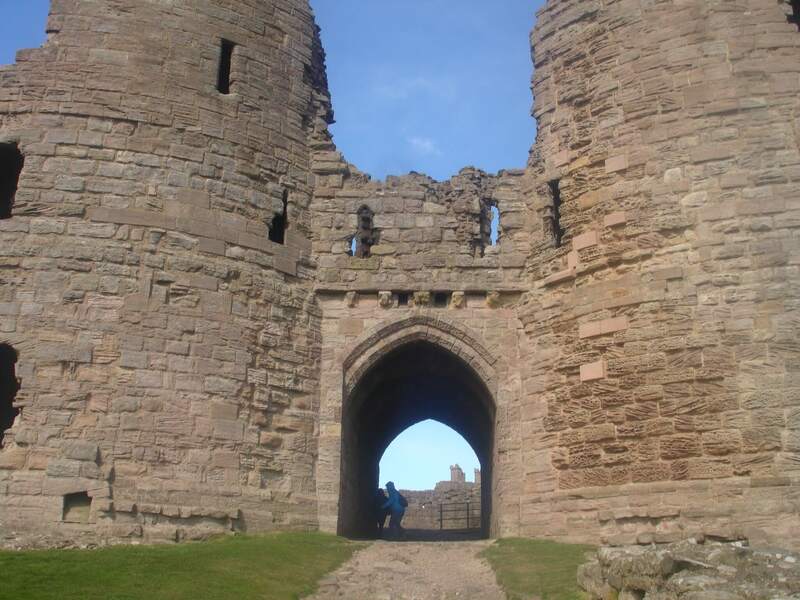 Because the thick walls of the gatehouse turned out to be funneling the wind through the tunnel-like entrance and magnifying it to a very high degree, as well as whipping up stinging grit into our faces and eyes. Mama just about made it through, with a determined sort of head down trudge, and she hauled me along after her with My Brilliant Big Brother in her windshadow. But he only got half way before his hat was whipped off his head, and as he turned and grabbed for it, the wind caught him and he was blown right back outside. He was not happy. He also could not make it back through on his own. In fact, on his own, he could barely stand up. Luckily, just as Mama was about to plunge after him, a kind passer by rescued his headgear and helped him negotiate the opening, and we all retreated to the shop to recover our shattered equilibrium. Mama even splurged on two chocolate insects in an attempt to cheer us up. Unfortunately this didn’t really work and once we discovered that being inside a former tower did not really lessen the windiness in any way, we refused even to attempt to explore the rest of the ruins, preferring instead to squat in the lee of one of the walls and stare mournfully at the tunnel we would have to go through again to get out. So we decided to cut our losses and leave. The fact that the howling gale was behind us on the way back did not really make it any less unpleasant, and we were all three thoroughly miserable for the length of the journey. I think Mama had it worst though as she had to carry me, complaining, the whole way and put up with my Brilliant Big Brother, his enjoyment thoroughly destroyed, hanging on her arm, complaining, too. At the end of this very very very very very very very very very very very very very very very very long walk was Craster village. 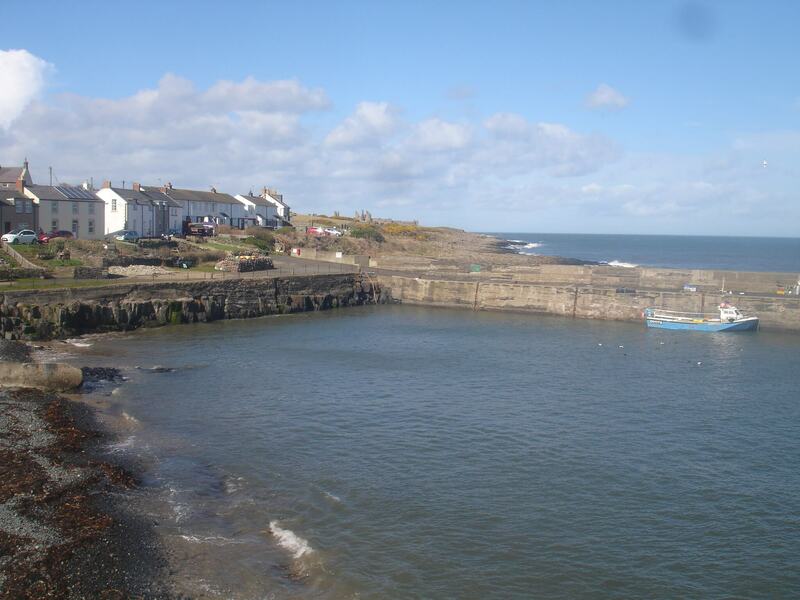 Craster’s main role in life is to be a pretty fishing village supplying its centrally placed smokehouse with seafood worth making very smelly. It clearly has something of a seaside holiday cottage industry as well, but is far enough off the beaten track that it does not consist just of amusement arcades and frozen fish and chip shops. We were spoilt for quality food emporium choices, really, given its size but in the end its café was just what we needed. We refueled on the sort of food we enjoy, and Mama had kippers. Which, she remembered half way through, she doesn’t actually like very much, but when nearly in Scotland and actually at the source of such things, how could she not? By the time we got back to the car, we had already turned The Day We Nearly Got Blown Away into an exciting and memorable adventure in our minds, and certainly we were so thoroughly tired out that we were perfectly happy to be stuck in a nice warm and above all unwindy car for another half a day. Not even getting stuck in a traffic jam outside Edinburgh because somebody’s lorry had been even more unfortunate than us and had actually blown over and was blocking the road could upset us now. Although I think Mama was less thrilled, given how much the car was shifting about in the wind on some of the more exposed sections of the A1, and having driven 700 miles to get away from such nonsense as sitting in queues of cars. If you do not choose ridiculous weather to visit in, or if your children are old enough or fat enough to be able to stand on their own two feet in a gale, Dunstanburgh Castle has a bit of everything. 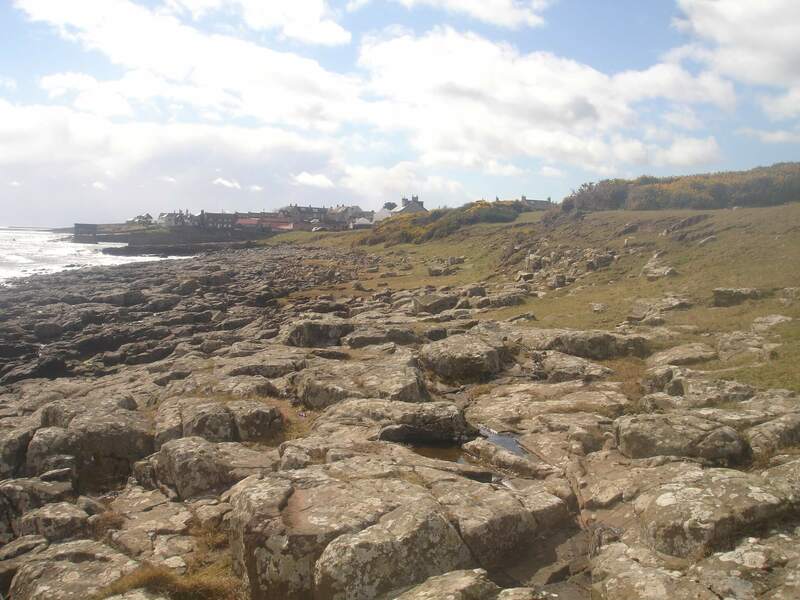 A nice gentle walk with good views, interesting rockpools to splash about in, ancient ruins to explore, pleasant and not overly touristy places to have lunch, and locally caught seafood. Should you go, and you should if you are in the area, you will almost certainly enjoy it more than we did. Dunstanburgh Castle’s page on the English Heritage website. Dunstanburgh Castle on the National Trust website. This is what the Hitchhiker’s Guide to the Galaxy has to say about cycling into the wind. Opening: Mon – Sun 10am to 6pm during the summer, until 4pm in autumn and spring. In winter it is only open at weekends. 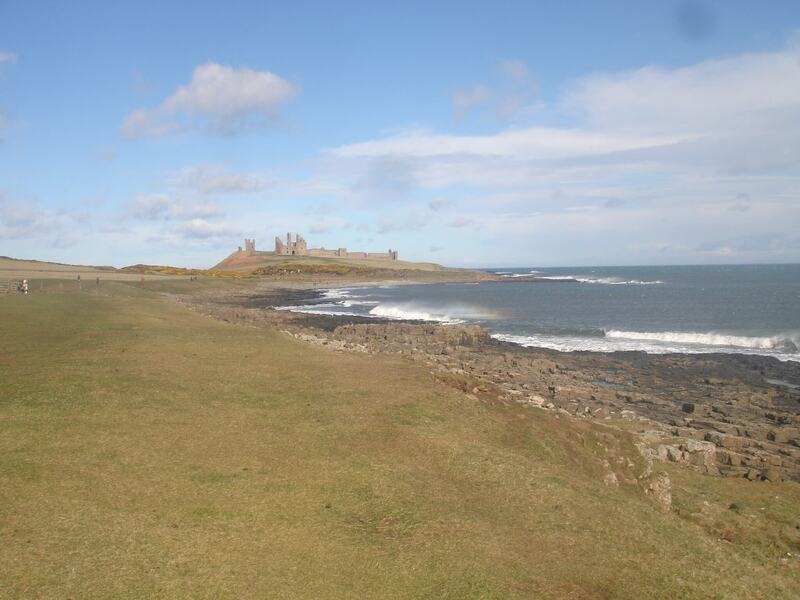 Admission: The National Trust and English Heritage have done a deal seeing as how you can;t get to the castle without walking through NT property, so Dunstanburgh Castle is free for both English Heritage and National Trust members. Otherwise it’s £4.90 for adults and £2.90 for kids over 5. 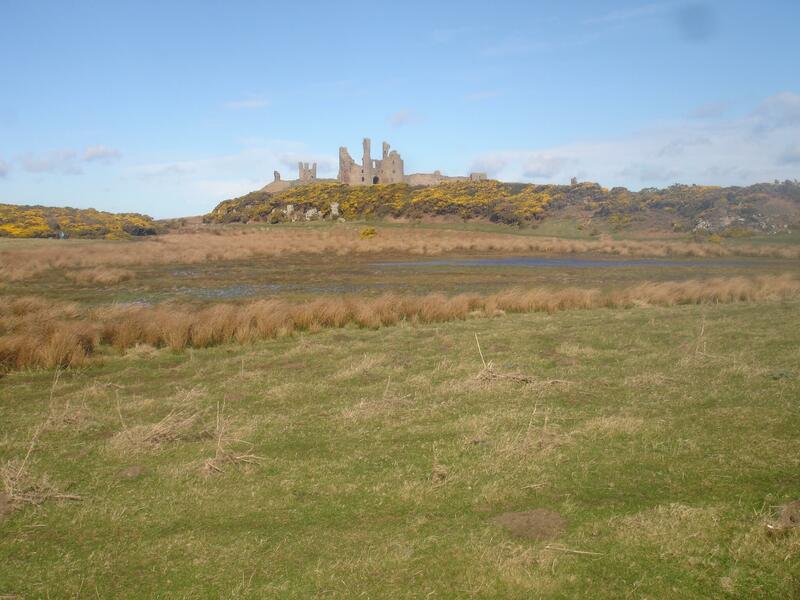 By car: Dunstanburgh Castle is 8 miles north east of Alnwick, and well enough signposted from there that Mama did not get lost trying to find it. There is a decent sized reasonably priced pay and display car park in Craster. The Castle is then a 1 1/2 mile walk. By public transport: There are two buses which stop in Craster, the Arriva service X18 and the Travelsure 418. The nearest train stations are at Chathill and Alnmouth, both of which are a good 7 miles away from the castle, apparently.